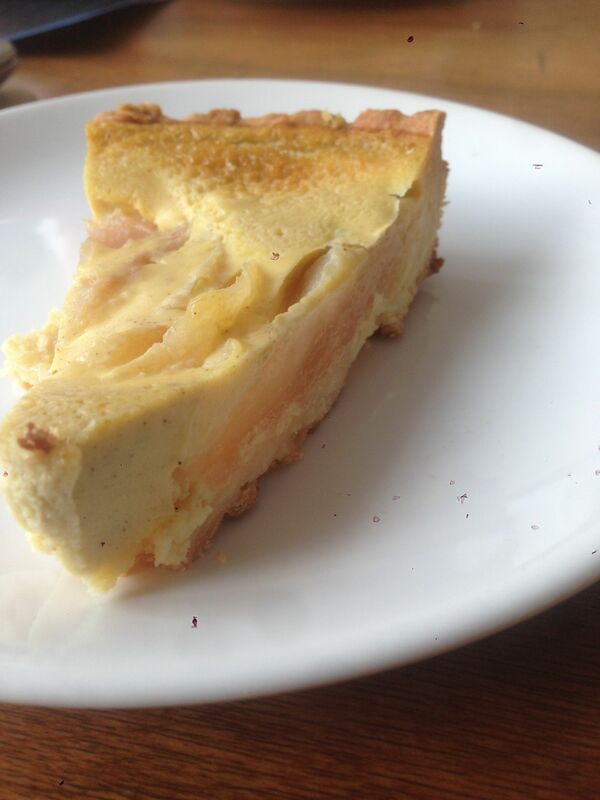 Thomasina Miers’ recipe for pear tart in The Guardian was a foundation here. I still can not use the new editor, so will publish my version as clearly as I can. First, make the pastry by blitzing the flour, icing sugar, salt and butter in a food processor for 20-30 seconds. Add the egg yolk, blitz again until incorporated, then add just enough egg white to bind it all together (reserve the rest for later). Roll the dough into a ball, flatten slightly, wrap in clingfilm and leave to rest in the fridge for at least half an hour. Now coarsely grate the pastry into a 25cm tart tin. Press evenly across the base and up the sides with your fingers, sprinkle with a little flour and use a small glass to roll it flat. Prick the base all over with a fork, then freeze for 20 minutes. Make a sugar syrup by putting the ginger, lime zest and juice, sugar and water into a wide pan and bringing to simmering point. Once the sugar has dissolved, add the pears and cover with a round of greaseproof paper to keep them submerged. Simmer for 10-20 minutes, until tender, then cool. Heat the oven to 200C/390F/gas 6. Remove the pastry from the freezer, cover with baking paper and some baking beans, and bake for 15 minutes. Remove the beans and paper, brush the base with the remaining egg white and return to the oven for five to 10 minutes, until the pastry is golden brown. Remove, leave to cool and turn down the heat to 180C/350F. For the filling, beat together the eggs and caster sugar, then stir in the creme fraiche and cinnamon. Remove the pears from their poaching liquid. Cut the halves into slices and arrange around the tart case, then pour over the filling (if you have too much, see below). Place Put in the middle of the oven for 20-25 minutes until just set. Rest for 20 minutes before serving. This entry was posted in Sweet pies and tarts / Tarty słodkie deserowe. Bookmark the permalink.